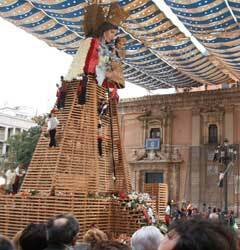 The Valencians construct a wooden silhouette of the Virgin in the Plaza de la Virgen ( Google Map). Over the days of 17th and 18th of March this structure will be totally filled in with bouquets of carnations. 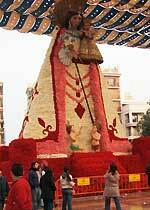 It is a whole ceremony: a falla after falla (the communities) dress up in their best and most colourful traditional costumes and pass by the Virgin bringing the flowers, which are then arranged by the crew on site. These processions last for two days, from 4pm to 1am. What is so great about them is that they seem to be the most joyful processions of the Fallas Festival, with all those huge groups of colourful people dancing and singing to folk music as they pass you by. 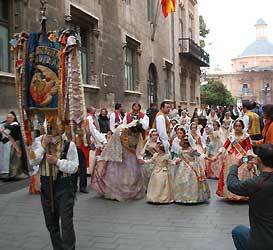 This event is not just around the Plaza de la Virgen. The entire city will be moving in and out. The entire centre will be jam packed. You will never have seen so many colours, never have heard so much Spanish music, and never have been so deaf from explosions. This event pretty much takes over the city for two days. The Plaza de la Virgen will be completely jammed in those hours, and if you don’t fancy the crowds just come some other time – you will be amazed at how far from the Plaza you can smell the aroma of those thousands of flowers. Not just the Virgin, but the entire square and the walls of the Basilica get covered - there are some fantastic photos of Plaza de la Virgin on "Travelling in Spain" . And no, the Virgin doesn’t get burned. The flowers stay until they totally wither, long after the end of the festival.